Please check room availability on the calendar below before submitting a reservation request. Note that set up and take down times are not reflected on this calendar; typically, two hours is needed between events. 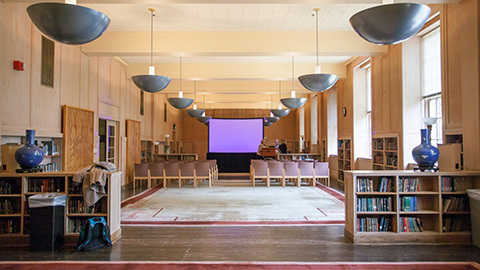 The Browsing Room may be reserved by formally recognized University groups for purposes related directly to the University’s and the Libraries’ educational, curricular, and administrative needs, and for events sponsored by the Libraries in accordance with the Libraries' Large Meeting and Event Spaces Reservation Policy. Plesae refer to the Knight Library Browsing Room Reservation Procedures for room capacity, pricing, and other room-specific use information. Questions: contact browsingroom@uoregon.edu or 541-346-3056. For information about a particular event, contact the event sponsor or try finding the event on the UO Event Calendar. For a list of upcoming events being held in the Browsing Room, see the UO Libraries' Events Calendar.